Turtle Moon Studios:Susan Shie. Turtle Trax 3-11-98. Lilac!!!!! Isn't this beautiful?? I am in the process of slowly starting to convert my pages over to Adobe PageMill, and I know the classic rule is to have all the site's pages have the same background.....but I'm a color freak, so I plan to at least make all the new diary pages be pretty new colors! Like a rainbow notebook! 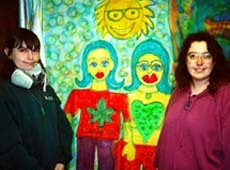 The latest Turtle Art Camp was Feb. 18 - 24, with Andi Stern of Athens, OH, and Anne O'Malley of Pakenham, Ontario, Canada. We had an absolute blast, never stopped laughing, and got a huge amount of art made. El Niño stayed everywhere else, and we enjoyed perfect springlike weather, with walks with Hattie and a whole mad shopping day! Anne races to catch up on the Astrology Chart Quilt project, after I gave the Kampers my Lucky Stars beginning lecture on how a chart is made and what everything stands for. Later I free associated in interpreting their personal charts. This joyful scene is the Campers proudly modelling their collaborative airbrush painting, after Jimmy's lessons in using and CLEANING the Aztek airbrush. 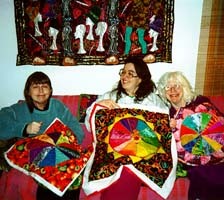 You can see how pleased we were with ourselves, over our first Astrology Chart Quilts in progress!!! I can't believe how much they looked alike, since I always tell people to just chop and do their thing. We all used rainbowesque colors and that's what happened. It'll be fun to see how they diverge, as we go about our separate lives, away from the ice cream and malted chocolate dope and wine before bed. If you're interested in coming to a Turtle Art Camp, go read about them and send us an email. You can pretty much select the dates you want. The camps are seven days long and have two to four campers living and working with us at Turtle Moon Studios. We still have spots available for the July 29 - August 4, 98 camp, and room for many, many more camps this year. Camps force us to clean the house and studios!!!! Sally Scott, 11 Chichester Gardens. New Germany. 3610. Natal, South Africa. Tel: 031-705-2462. She would like to have these slides by the end of April, if possible. 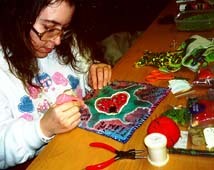 Please pass the word on, and PLEASE, send the same stuff to Robin's and my registries, so that your work will be included in the history of GREEN QUILTS and so that curators may eventually look you up!! Thanks! 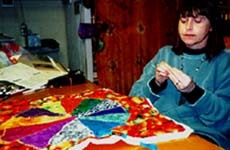 Check out my newly upgraded GREEN QUILTS pages, to see what else is going on, or to learn what on Earth a GREEN QUILT is. That's also where the registries info and addresses are. Whatcha waitin' for?? Introducing my new spring line of Whammies!!! I have been making Love Whammies for years, as part of my own personal and playful and positive energy charm work. Now I'm adding Money Whammies and Health Whammies. There'll be more! What is a Whammy? According to my Lucky Charm School, it's a powerful little talisman, made to bring the owner of it good luck regarding the whammy's theme. These are meant to hang on the wall or be part of an altar, but you could sew them onto a bag or even wear them. Here's a brand new Love Whammy, for instance! 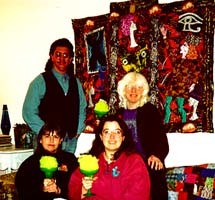 It's all hand sewn and quilted on black velvet, with glass star beads, found in Andi Stern's Bead House catalog. You can order a Love Whammy like this one, which is 8"h x 6"w, from me for $200. Smaller ones will be less, natch. 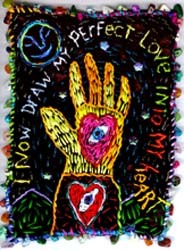 Love Whammies, made my way, have a left hand, the hand which draws energy to you, palm out, with a heart in the palm. An eye, representing the Soul, the wise inner part of oneself, is in the heart. This charm is used to bring perfect love to the owner. This Money Whammy is hot off the presses! It's made with all hand embroidery and quilting on dark green velvet, beading, and gemstone embellishment. It measures 7.3" h x 4.5"w.Price $150. You can order one larger or smaller, priced accordingly. I can use other symbols and words for you. No two Whammies will be the same, as I draw by stitching, since it's hard to see marks on velvet. Money Whammies, again according to the Lucky Charm School, are designed to bring prosperity and money to the owner. In the Whammy above, the left hand holds a diamond with the Soul Eye in its center. All the colors are money related. A sun, at the top of this one, is for positive and successful energy. The watermelon and fish are ancient symbols of abundance (seeds and eggs.) The dollar sign on this one is for money up your sleeve, always more where that came from. These Whammies are for sale, and you can order one made by me, personally for you or someone else. And there are lots of other things to buy in our Stuff to Buy Catalog. You can just email me to place an order. For Valentine's Day, I made Jimmy a Magic Trout Lucky Fish Whammy. He must carry it whenever he goes fly fishing, and it will bring him much luck! This is one of the more exotic whammies made at the Lucky Charm School, but I hope it gives you the idea. There is a way to create a charm for every occasion! 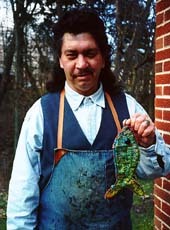 Here's my darling Jimmy with his Valentine: The Magic Trout Fish Whammy. You can see how absolutely pleased he is with this Lucky Charm, but just wait til he catches Old Fighter with it!!!! !